This sweet printable from Picklebums gives you 4 sets of glasses to cut out and decorate (plus wear when you’re done!). While decorating our glasses, I talked to the boys about how we can choose to see everything in a happy or sad way. If we see the good in something, we are being optimistic. We had fun creating the glasses, and then doing several role plays that helped us discuss what “being optimistic” means. Download your own set of glasses here. I printed out these cards from Creative Family Fun when we had a family reunion a few months ago – so the kids could take turns picking them out when they needed a distraction/new activity. After cutting them up I simply took out the ones that I did not think the kids would relate to (or that we did not have materials for) since all children are different. There are tons of fun ideas in these! I just love this set of printable foods from The Craft Train. Children are invited to create several different “plates” of food depending if the food is a healthy food or a junk food. Kate actually had her children glue the foods on paper plates, which was super cute! However we didn’t have any paper plates around, so we drew a few circles – green for “green light foods” (eat as much as you want), yellow for “yellow light foods” (eat only occasionally as these slow you down), and red for “red light foods” (these do nothing good for your body). While we were pasting the foods on, we talked about how sometimes we really want to do something but it is not good for us. We have to be disciplined to do what we know is right or best. This is very true in eating healthy foods and not eating too many junk foods… so it was an easy way to learn what “discipline” might mean. Download this printable (which includes several other pages and activities!) here. I am a big fan of using superheroes to help my boys develop a passion for helping others; since they want to play superheroes anyway, I figure why not make the most of it. 123 Homeschool for Me has created an incredible packet of superhero materials, several of which we have enjoyed during superhero play. While using the printables and playing superheroes, we simply talk about how true heroes are people who use whatever they have to help others. Whether it is using their strength, knowledge, tools, or compassion, heroes do their best to help everyone around them. There are so many play scenarios to use in this way! Download the superheroes pack here. Download your set of puppets here. And lastly, here is one more bonus printable I published a few months ago: a homemade place mat to teach manners at the table. 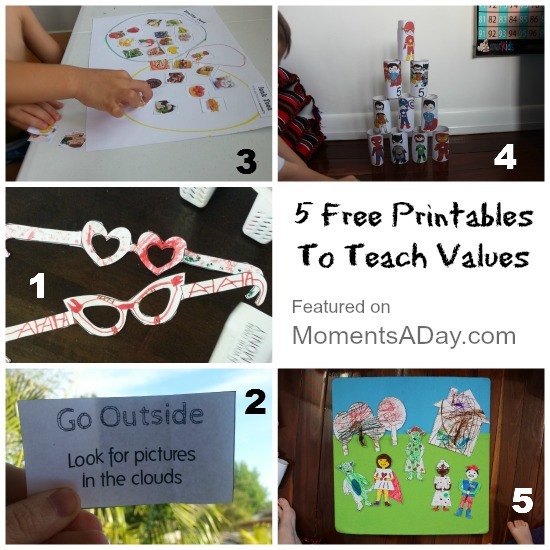 I hope you enjoy these fun printables to teach values! If you know of another great printable activity that can help kids learn about a character trait, feel free to add a link or idea in the comments! I love how you create learning messages into your daily play Chelsea. Your kids are going to grow up so wise! Thank you for these freebies AND for sharing your ideas. I pinned the article so that my counseling friends can head your way. How blessed your children are! A great collection Chelsea, Love the Go Outside one 🙂 Thanks for including ours in the mix too. What a great selection of truly helpful printables. Thank you for sharing these! 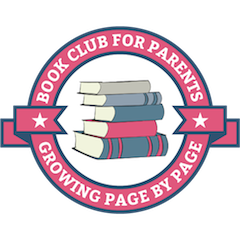 I really enjoyed learning about the ways you put your own spin on each of these resources to teach valuable lessons about values – lessons that children can relate to and understand. Thank you sharing this insightful post. Thank you so much for sharing our Go Outside cards. I’m so happy to see that people are using & enjoying them! Now I need to go check out these other printables… they all look awesome! i have required idias of activity / games on empathy for early child/nursury basis.